A warm welcome to all of the members of our Aroma Tours Newsletter in more than 35 countries around the world. Robbi and I hope that you have had a wonderful festive season and we wish you peace and prosperity in the year ahead. We are very grateful to see that our Aroma Tours are continuing to flourish and although we will be offering a few less tours this year, we are well on track for another successful tour season. Congratulations to our readers in the USA on the inauguration of President Obama. Greetings also to our Asian friends, as we begin the year of the Ox. May it be one of peace and true prosperity for us all - Gong Xi Fa Chai! 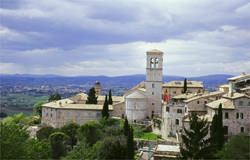 As well as nourishment for the eyes, life takes on a different pace with long lunches in beautiful hilltop villages, wonderful coffee, delicious wines, truffles, pecorino cheese, porcini mushrooms, prosciutto, fresh pasta..... ( so many wonderful tastes ), laughter and the fine Italian art of "dolce fa niente" - sweet doing nothing! Bill has worked for Australian Geographic and spent many years as an official photographer for the Winter Olympics, as well as several very successful coffee table books and a busy professional career. Robbi and I are pleased to see that the enthusiasm for our Aroma Tours is continuing to steadily grow as more and more people are hearing about us "through the grapevine". The next few months are our busiest time of year for bookings, so if you are considering joining us this year or if you have any questions, please do get in touch with us shortly either by email at info@aroma-tours.com or by phone on: +61 3 5331 3254 (afternoon/evening USA time zones, mornings from other countries). From the USA/Canada the "international dialing prefix" which replaces the '+' in our phone number is 011, from most other countries it is 00. If you are planning to join us this year and are ready to reserve your place, all you need to do is visit our Tour Booking Page where you can either make your booking on-line via our secure server or off-line via mail or fax. This year will be Robbi's biggest year so far of travel for her work outside of our Aroma Tours' commitments. She will be speaking at several conferences in the USA: San Francisco in February and Chicago in October, as well as spending some time in Minneapolis and Florida. She will also be teaching workshops in China, Hong Kong and Singapore. I will be with Robbi in the USA and we are greatly looking forward to doing some more exploring including the Napa valley and taking the opportunity of catching up with some of the dear friends who have travelled with us over the years. With more time to focus on her work and the continued success of her book The Blossoming Heart, now in its second edition as well as Chinese and Spanish translations, the years ahead are all set to get even busier and more exciting. To one side of the colourful weekly market in Carpentras with its olives, sausages, cheeses, vegetables and household goods, a crowd gathers. People jostle and the atmosphere is conspiratorial with whispers and surreptitious glances into baskets and plastic bags. People sniff, grunt and feel the wares before scales are produced and significant sums of money change hands. The objects of all of this activity are what appear to be small lumps of dirt! In fact they are the aromatic and highly prized Tuber melanosporum - the Truffle or "Black Diamond" of Provence. 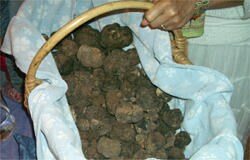 So prized in fact, that quality fresh black truffles are traded at well over US$800 per kilo! Truffles almost exclusively grow on the roots of oak trees in a very few regions of Provence and the Perigord. There are also other varieties that grow in Italy and other countries but according to the French, they have a lesser flavour and aroma compared to the Provencale specimen. Of course the Italians are quick to trumpet the virtues of their Tartufi and having enjoyed various varieties of truffles in both countries I can say that as long as the preparation is sympathetic to the delicacy of the flavour they all have their own delicious virtue. In the past pigs were used to help find truffles in their subterranean hiding places using their acute sense of smell but they have now been replaced by specially trained dogs, who unlike the pigs, are easier to handle and are not hell bent on eating the prize. There is a lovely story from the Perigord about a man who discovers to his horror that his prize truffle pig had broken out of its pen and gone on a truffle eating spree - quelle horror! Once discovered, truffles should be left in their covering dirt to help preserve them and as such they will last for 3-4 days before starting to loose their aroma and flavour. One of the best ways to enjoy truffles is to make an omelete with lovely fresh farm eggs and add slivers of fresh truffle - absolutely delicious! 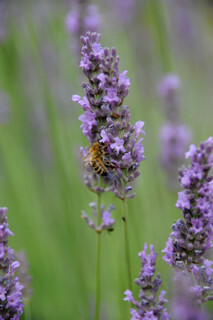 After more than 10 years of inspirational teaching during our Provence Aromatherapy Retreat, Dr Daniel Penoel has now decided to increase his focus on his busy clinical practice in France and as a result this year will be the last opportunity to experience Daniel's passion, enthusiasm and deep knowledge of applied aromatherapy with us in France. We are very grateful to Daniel for his willingness to teach for us despite his busy schedule and we wish him well in his practice and research. Next year we will be introducing an exciting new format for the retreat and when all of our preparations are complete we will announce the details in this newsletter. "When the way seems unclear, those who live by their passion will always find the path ahead."